Today's episode features Dr. Christine McCarthy. 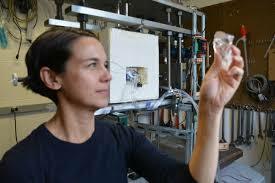 She works at Columbia University's Lamont-Doherty Earth Observatory as an ice squeezer. In her own words "I torture ice to learn its secrets. I am particularly interested in how the micro controls themacro, that is, how grain and phase boundaries, defect concentration, and partial melt influence the mechanical behavior of terrestrial and planetary materials. I run laboratory experiments and have been known to cheer when something works or sit there staring at a creep curve for an hour straight. I make-n-break my own samples, systematically controlling each impurity or defect."